This is a guest post by Kristin Thomson, a social researcher, musician and co-director of Future of Music Coalition’s Artist Revenue Streams project. We'll discuss this groundbreaking project on the next episode of WFMU's Radio Free Culture, Monday 6-7pm ET. For at least fifty years of the 20th century, the relationship between music and radio airplay was fairly well understood. Record executives knew that if they wanted a hit record, they needed that song to get played on the radio, preferably as many times as possible. In fact, until 2000, radio airplay was essentially a prerequisite to selling significant amounts of recorded music. Clearly, radio airplay is still critical – especially for genres like pop, country and urban/R&B – but in recent years both radio and the mechanisms for selling music have been upended. Traditional commercial radio, with its limited playlists and regional reach, has been challenged by new forms of radio: webcast versions of existing stations (including WFMU), pureplay webcast stations like Soma-FM or Pandora, and Sirius XM satellite radio. Then there are the interactive services like Spotify, Rhapsody, Last.fm, and Rdio, many of which mimic radio through playlist options or pre-programmed channels. And there's YouTube, now considered one of the most widely used sources of music discovery in the world. The sale of recorded music has also changed. Prior to about 2000, the money that a musician could make from the sale or license of a sound recording was pretty simple: you could sell physical copies of an album or a single in a retail setting like a record shop, you could sell them via mailorder, or at shows/gigs. If you were lucky and your music was placed in a movie or TV show, you could make money from the synch license on the master recording. But that was about it. Since about 2000, these options have expanded to include digital sales on stores like iTunes and Amazon, digital performance royalties when sound recordings are streams on non-interactive services like Pandora or Sirius XM, and interactive service payments for streams on Spotify/Rhapsody. And there are more. The average US consumer now has dozens of low-cost or free ways to listen to and discover new music. What has this done to the relationship between radio airplay and music sales? And, more to the point, are musicians benefiting from this changing landscape? In 2010, the nonprofit Future of Music Coalition launched Artist Revenue Streams, a multi-method, cross-genre examination of musicians' revenue streams, how they are changing over time, and why. We used three methods to collect data: in-person interviews with over 80 hard-working musicians and composers; an online survey that was completed by over 5,300 US-based musicians and composers, and financial case studies that allowed us to fully examine musicians' income and expenses over time. We have published over a dozen reports looking at the collected data through various lenses. We have looked at specific genres like jazz. We've examined the revenue streams of musicians who are conservatory graduates, and at the impact of teammates like managers, publishers and booking agents on income. We've also published a report about the shifting nature of income from sound recordings, including new revenue streams like digital sales, digital performance royalties, and interactive service payments. 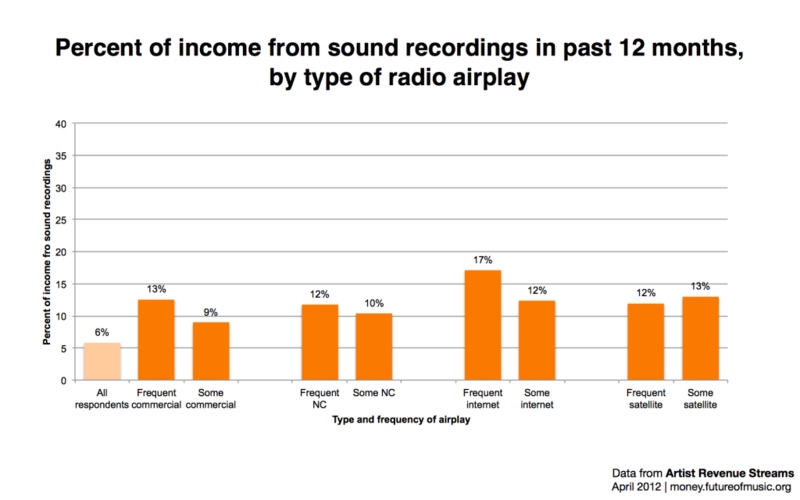 We have also published a report about the impact of radio airplay on income. This is not our first foray into the issue; since 2001, FMC has published a number of reports about musicians' access to commercial radio, the dangers of further radio consolidation, and the impact of the FCC's anti-payola consent decrees. We have also been active participants in webcasting rate-setting proceedings, and our general counsel is an artist member on the SoundExchange board. 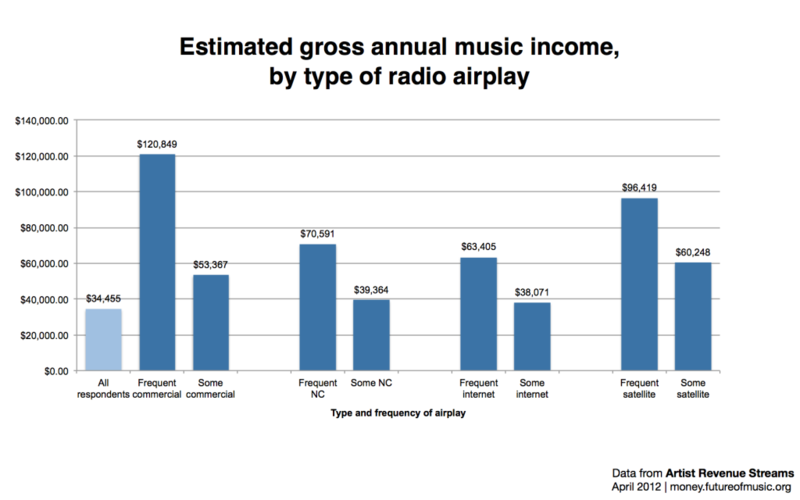 What did we find in the Artist Revenue Streams data about airplay? According to our research population, frequent airplay on commercial radio is rare, but new forms of radio are providing airplay opportunities for more musicians. The survey data also indicates that those who received frequent airplay had a profile that was distinct from the rest of survey respondents. Correlation is not causation, but a higher percentage of their income was derived from music. Their gross estimated music income was greater than those without airplay. And, they reported a greater percentage of last year’s income from compositions, sound recordings and live performance. Traditional radio airplay remains the most likely way for mass market music fans learn about new music, though the quick ascendance of Sirius XM, Pandora, NPR and a whole host of radio-like services and specialized webcasts has greatly diversified the field. For a music lover, the choices in radio-like experiences have never been richer or easier to access. And for musicians and composers, especially those who work in genres that have been marginalized by commercial radio for decades, the development of new sites and services seems like a good thing. Indeed, technology has made it possible for even the smallest local radio stations to increase their leverage, both through partnerships with local record stores and promoters, and also through streams to a potential global audience, thus benefiting musicians who are getting airplay at even the local or regional level. Yes, radio is still relevant. It’s just that the definition of radio has expanded. So, is airplay important to musicians' livelihood? The Artist Revenue Streams data suggests yes it is, but in different ways than before. Given the expansion of radio-like experiences, there are more opportunities than ever for musicians – even those in niche genres – to get airplay. But how much airplay matters on these emerging platforms depends on musicians’ own circumstances. For some musicians, airplay is believed to impact sales or concert attendance. Others believe it leads to brand awareness. And for a few, airplay on digital platforms has become a noticeable revenue stream on its own through the massive growth of digital performance royalties paid to performers by SoundExchange. 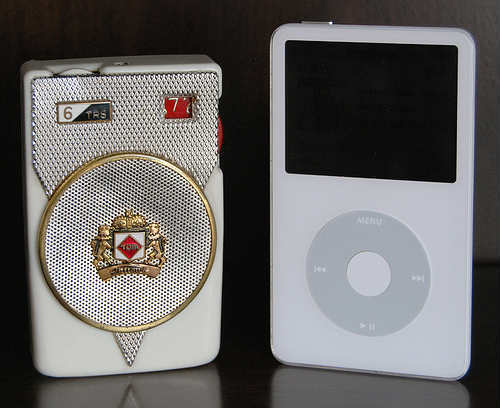 Radio remains an important part of the music ecosystem, even as both "radio" and the mechanisms for selling recorded music have changed and expanded drastically over the past fifteen years. There are a lot of moving parts, and musicians' experiences with both radio airplay and recorded music sales are impacted by many other factors: their genre, the roles they play, their career trajectory, their teammates, and their label relationships. The Artist Revenue Streams project provides a snapshot in time at a moment of tremendous change. As is the case with many parts of this digital transition, musicians’ experiences are unique, and there is no one-size-fits-all solution. We encourage you to take a deeper look at the findings, and at our future releases where we will continue the conversation about how musicians and composers’ revenue streams are changing in the 21st century. Kristin Thomson is a social researcher, musician and co-director of Future of Music Coalition's Artist Revenue Streams project. @kristinthomson. Tune in to hear Artist Revenue Streams co-director Jean Cook join fellow musicians Greg Fox and Rebecca Gates on the next episode of WFMU's Radio Free Culture, Monday Feb 25th, 6-7pm. Subscribe to the Radio Free Culture podcast or check out the archives. Great marketing advice for any real estate professional. I found this post because I am doing exactly what you suggested and trying to stay one step ahead of the others!